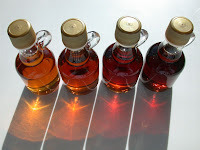 Maple syrup is a sweetener made from the sap of maple trees. It comes from Eastern Canada, but also from Vermont in the US. The Native Americans were the first to discover maple syrup and considered the sap as a source of energy and nutrition. They drank it as a sweet drink and used it for cooking. Around 1850, sugar was so hard to find and so expensive that people used maple sugar instead. Production devices evolved throughout the centuries. The production takes place in the sugar bush (forest exploited for maple syrup), producers collect maple syrup by tapping through the tree’s bark, and then let the sap run into a bucket. This task requires daily collecting. However, collectors often use a quicker method, which consists in plastic pipelines. A hole in the bark can only produce sap for one season. This is due to the natural healing process of the tree. Then, the sap is cooked in a pan, the evaporator. The latter is divided into two sections: the front-pan and the back-pan. After the water has evaporated, the liquid becomes denser and sweeter. As the sap becomes denser, it works its way from the rear evaporator to the front evaporator. Then, the valve connecting the two pans is shut. This is a crucial period in the production (part 2). The next stage is to test the density with a hydrometer. If the density happens to be too low, the syrup will not be s weet enough and if the density is too high, the syrup will crystallize. February, March and April (warm days and freezing nights) are the best months for production. A tree must be at least 40 years old and have a diameter of 25 cm at chest-height before being tapped. Intermediate levels of boiling can create other products, such as maple cream, maple butter or maple sugar. Maple syrup is served with a great variety of dishes, such as pancakes, waffles, French toast, ice cream, doughnuts, biscuits, hot cereal, and so on. Tourists who go to a Sugar Shack (big farms where maple syrup is served directly to the public) often order Maple Taffee (also called Tire sur la neige in Quebec and Sugar on Snow in North America). This is hot maple syrup poured onto fresh snow and eaten on sticks before it melts. Since there are so many maple trees in Canada, its leaf has come to symbolize the country and is represented on its flag. It is also the symbolical tree of several US states, Vermont and New York among others. Maple syrup is also used in a lot of recipes.